Hi, Nick Husson here. I've been hearing a lot of talk from people in the neighborhood about how expensive it is to cater their sports parties. After all, football season is here (Go Panthers!) and it's time to throw some incredible tailgate parties. 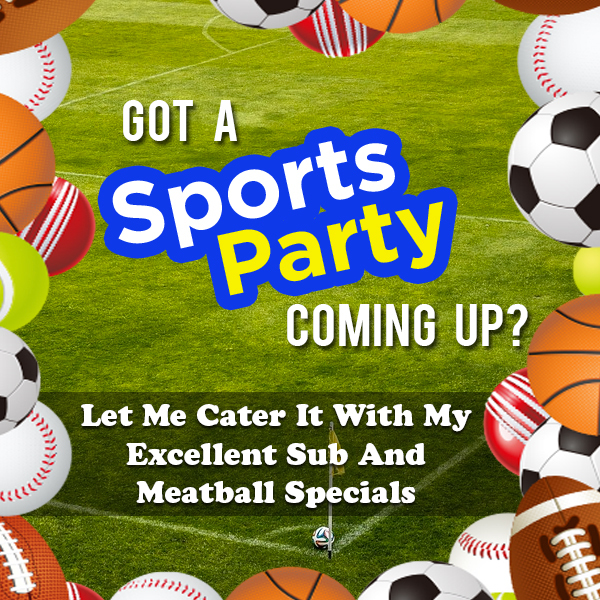 With that in mind, I'd like to remind loyal Husson's Pizza customers about two of our greatest catering deals: the sub-party tray and our hefty meatball tray. Both of these trays cost a mere $29.99 and are a great investment for any football party. First of all, you got the sub-tray. This beauty has 15 portions of a variety of items including pizza bread, ham and cheese sub, meatball sub, turkey sub, veggie sub, Italian sub, Hawaiian sub, steak sub, BLT sub, mild chicken sub, fiery chicken sub, and grilled chicken sub. I've found this is perfect for big parties which feature a lot of people with different tastes. However, if you want something a bit more "meaty," our meatball tray is probably your best bet. You get an incredible 50 meatballs in several different sauces, including BBQ, Buffalo, General Tso's, sweet chili, and marinara. I personally love serving this tray at my own football parties, especially during Cam Newton's incredible 2015 season. Even if the last Super Bowl didn't quite go our way, the food was, at the very least, incredible! If you're interested in ordering one of these party trays (or know someone who might like one for a gift) please don't hesitate to contact us today. I love to serve my customers the food that I, too, love to eat! Ask about our group lunches, starting at $5 per person.